Eep! 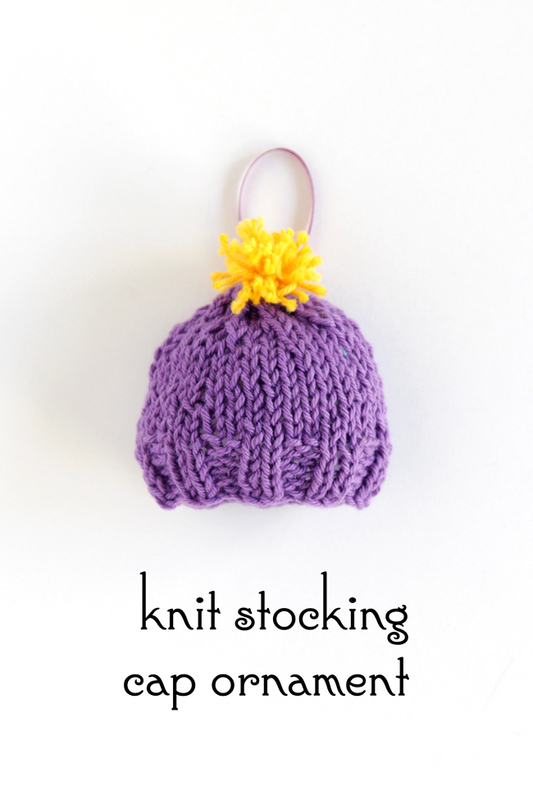 This little stocking cap is so cute – I love it! It’s also the fourth ornament in our 12 ornaments of Christmas series, joining the ranks of a knit present, heart and star. 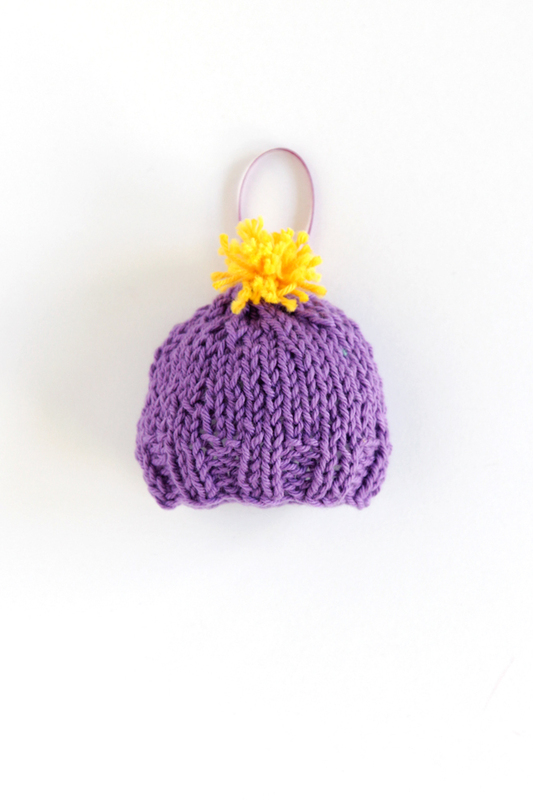 This hat can easily double as a doll hat or be knit to top a bottle-shaped Christmas gift (the best kind, right?). I think my favorite part of this adorable little hat is that it’s literally just a tiny hat – I would absolutely wear this colorful beanie any time had I made it human-sized. Get an inexpensive, printable, ad-free PDF of this pattern here, or you can continue scrolling to see the pattern now. 1 pack Lion Brand Yarn Bonbons in Beach, which comes with 8 mini skeins. 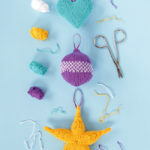 – You need less than a skein of purple and yellow to complete the ornament. Gauge & dimensions: 22 sts & 28 rows over 4 inches, knit in stockinette stitch. 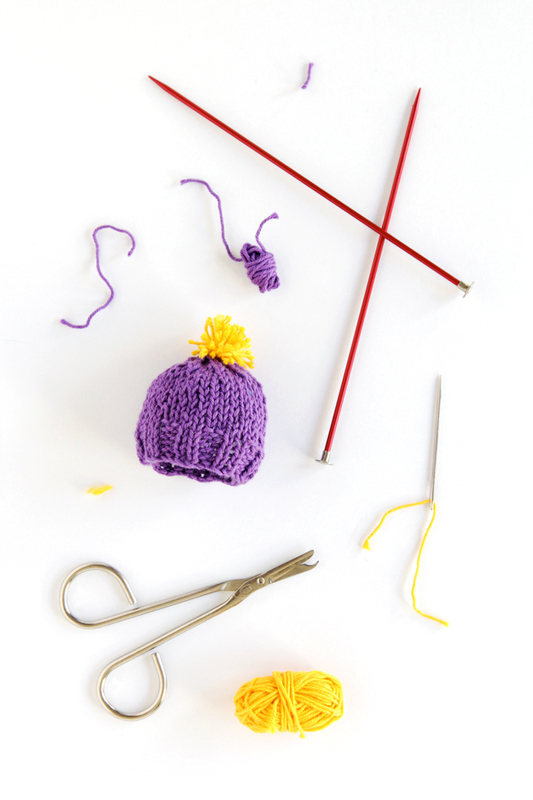 The hat measures approximately 5” in circumference and 2.25” from cast on edge to bind off tip. Looking for a printer-friendly version of this pattern? 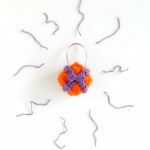 Grab an inexpensive, ad-free PDF of this pattern right here. CO 32 sts in purple, join into rnd. Break yarn & draw tail through remaining loops to secure. 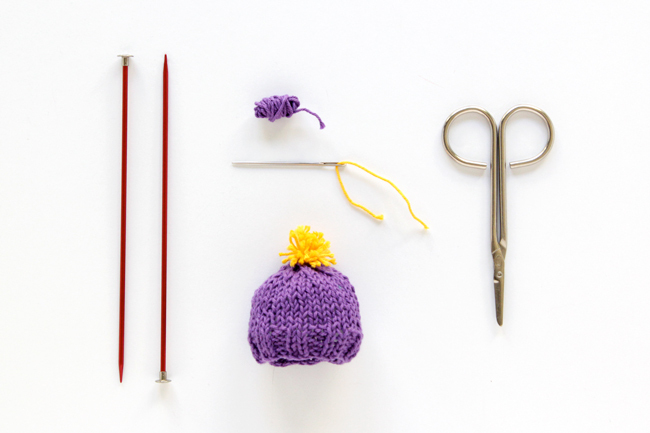 Make a tiny pom pom in a contrasting color and attach it to the top of the hat. Weave in all ends. Using a needle & thread, sew a scrap of ribbon to the back of your finished ornament to hang. If you’d like to stuff the hat, you can use poly-fil. You can also knit or crochet a circle to sew across the bottom of the hat, but I filled mine with poly-fil without a plug. Years on, the poly-fil has yet to fall out on its own. Don’t forget! If you make this or any other of the 12 ornaments of Christmas, you can share them on social media using #handsoccupiedhohoho! Social media not your thing? 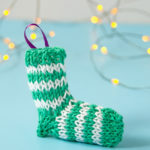 Check out the Ravelry thread I started in the Hands Occupied group if you’d like to share them there. Thank you, thank you. 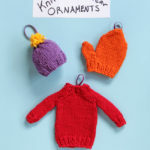 The Mini Cap and Mitten are adorable.